We're so glad to be able to participate to this jam, that's a wonderful idea. Team name : Sliced up Dudes. Team members : Myself, Thibaut Petiot, Emiliano Meurant, Swann Klein and Meryl Mariatte. asd / left stick : run. space bar / Face Button Bottom : jump. E / Face Button Left / Face Button Right : shot. Menu navigation use D-pad and not stick. We hope you'll enjoy this game. Starting up Twitch stream, prepping stuff now, but will start playing soon! Generic Shooter now available on the UE4 Marketplace! NOTE: Multiplayer, best played 3v3. Solo is possible though, but lacks challenge. Pink vs Blue team multiplayer (up to 3v3)! Rocket pinball style. 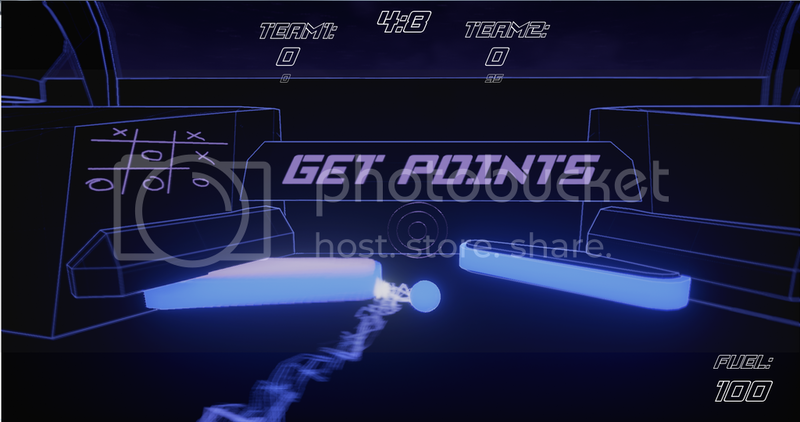 Roll and bounce through the level, use rocket boosts to become a guided missi... eh flying pinball? Change the arena in your team's colour, and score the points before the opposing team does. The team with the most points when the time is up wins. We are a programming student (Bart) and a Design student (Me) at NHTV's IGAD. We unfortunately only ended up joining this after the game jam was already in full swing, I do want to give a shout out to Laura, a rookie who made about 18 3D models in her life, of which 12 were for this game jam. The best way to learn, under pressure! Uh.. Right? Edit 28th of July: made the post a bit neater, added about us, fixed typo's. Added YouTube video and added updated build version. - Interface consistency was bugging me, teams are now correctly called Team Pink and Team Blue. - Removed the pinball plunger at the spawn. Now there is no more occasional spawn physic bug. - Changed the name of the packaged project - 0.3 still contained the first title, it is now correctly displaying KABOUNCE! Good luck to everyone on Thursday and thanks for reading. Last edited by StitchHeads_Tim; 07-28-2015, 06:28 PM. Escape from a wall of deadly explosions as you avoid continuous obstacles. 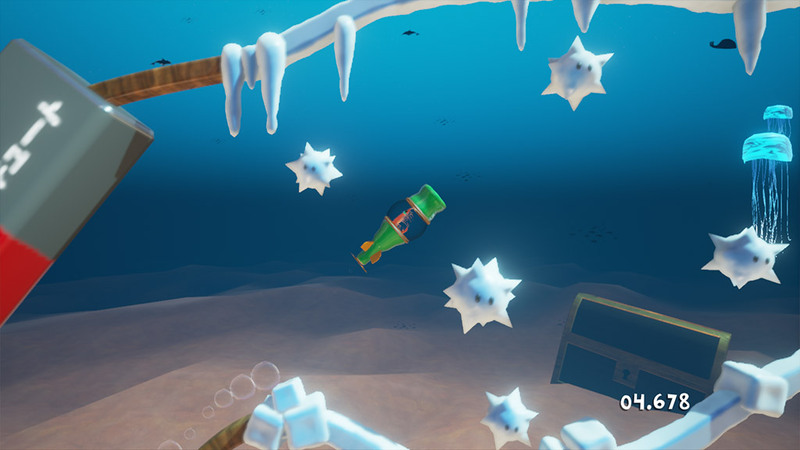 Use your rocket pack with spacebar to fly above spikes. Roll into a ball with shift to traverse flame throwers and to get through tight spots. Run as far as you can without getting riggidy riggidy wrecked! late edit--I could not get this to package! It was madness. It's late, sure, but you can probably tell by how incomplete it is that we didn't add anything new after the deadline. I'm just really glad I was able to get this up so you can see the awesome artwork the rest of the team contributed! Last edited by mister0il; 07-27-2015, 05:32 AM. Try to roll down the hill and hit the blue wall as strong as you can to rocket the red cube out of the chair onto the sea. Last edited by minsk; 07-27-2015, 12:07 AM. You are the Rocket Shepherd! Explore strange alien worlds! 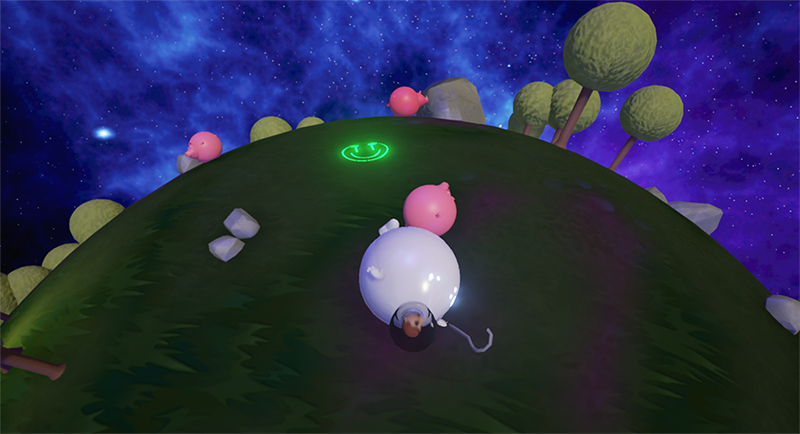 Herd the rolling animals to the goal using rocket volleys from space! Protect them from violent predators that try to eat them! 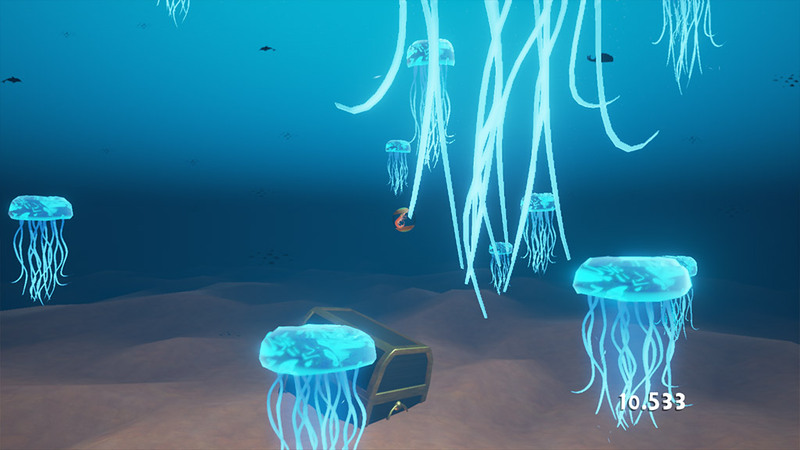 The game only supports mouse and keyboard due to the nature of the gameplay. 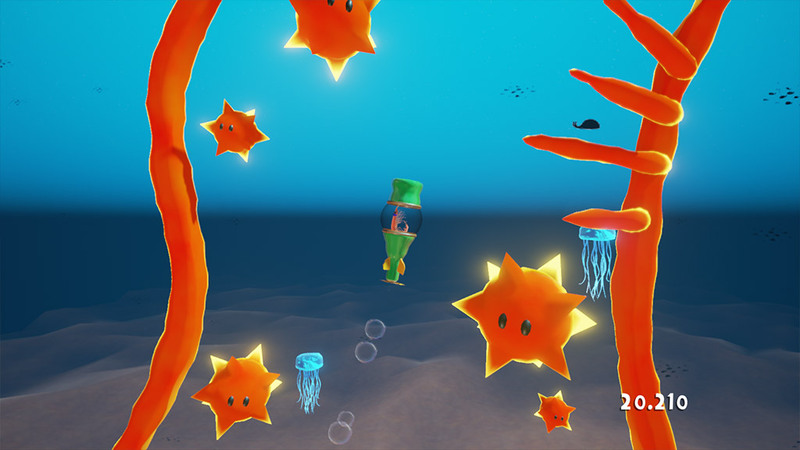 Players can choose any level from the main menu, but the game plays in sequential order from the first level as well. 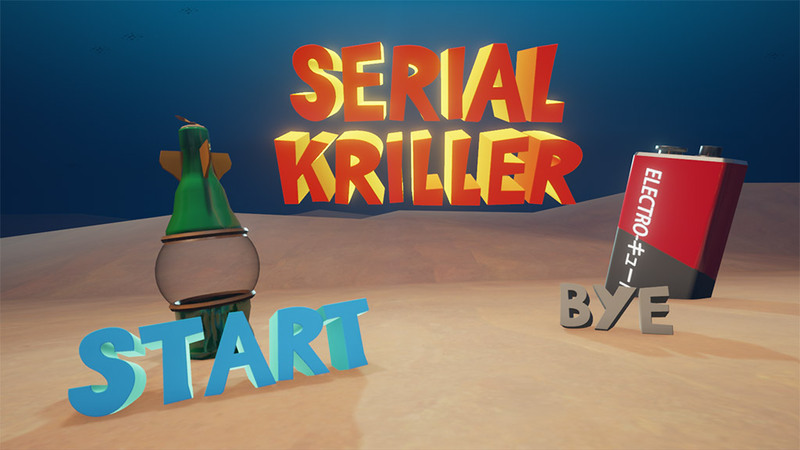 Studio Giblet is comprised of five students from The Guildhall at SMU (three level designers and two artists) looking to get some more game development experience over their summer break. 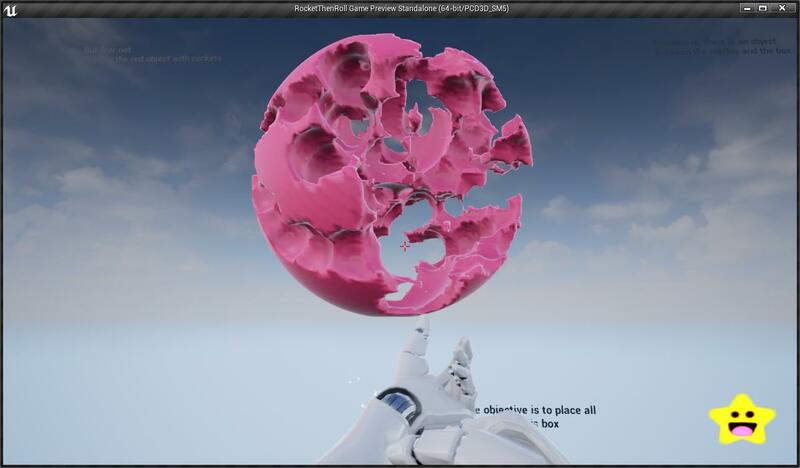 It was coded entirely in blueprints by the designers, with all the assets other than Unreal 4 starter content being made by the team during the timeline of the game jam. The team had some trouble initially getting inspired by the theme, but they are proud of what they were able to accomplish in the end! Remaining known bugs: HUD indicator for animals doesn't update correctly to reflect score; sometimes rockets don't explode. - We had to post a development build of the game, for unknown reasons a shipping build constantly crashed to a "failed to open descriptor file" error. As you can see above, we also had some serious internet troubles, so while we have a build that was time-stamped uploaded before the 12PM EST deadline, we didn't finish AND upload a fully working build til 3 hours late. - The game is full of attention to detail, particularly on some mostly cosmetic game systems, but it was all done in the spirit of having fun during development above all else. 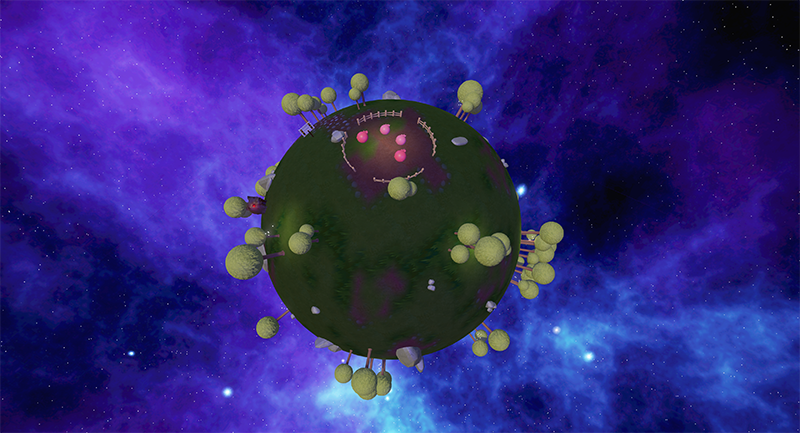 Some of the interesting issues we addressed were: creating gravity for globe levels, orienting decorative meshes to a globe to make it possible to make 3 levels within the time frame, making rolling enemies that seek out and kill the friendly critters, and dynamically creating decals on the surface of the globes. - Due to how much time we devoted to everything else, we did not end up having time to add sound effects. - Biggest lesson learned? Have to scope and plan a project even when it's just a weekend game jam if you want to get everything done the way you hope to! - The team name is relevant to a system in the game that kept the team inspired throughout the project. Edit 1, 11:20PM CST: Adding fully functional build link. Edit 2, 12:30AM CST: Formatting and more descriptive text. Edit 3, 2:20AM CST: Cleaned up bugs to create intended functionality on two major systems (that got messed up before the deadline due to source control), and uploaded that build. Don't expect it to be judged for the "contest" aspect, but really wanted to have it for people interested in playing. Last edited by ieverin_gh; 07-27-2015, 03:22 AM. Reason: Formatting and some more description stuff. The world's most underrated crustaceans are lining up to try their luck at a bottle rocket/rolling marble obstacle course! - Sound effects AND music (made by yours truly)!! - New krill and gear every race! Controls: WASD to move, Enter to restart, Escape to exit. Last edited by bzxo; 07-27-2015, 07:33 PM. Hello fellow game jammers! Here is our submission. We decided to come into this late so we only used 24 of the available hours! Oh dear! If your browser says it's not commonly download it just right click and press keep. Last edited by Graeme_Crackers; 07-27-2015, 02:51 AM. This is my first time, please be gentle :3 When the theme was announced I thought it would be cool to have a game where you shoot rockets to clear way for rocks to roll. That was the plan, and with that was born the game "Rocket then Roll". 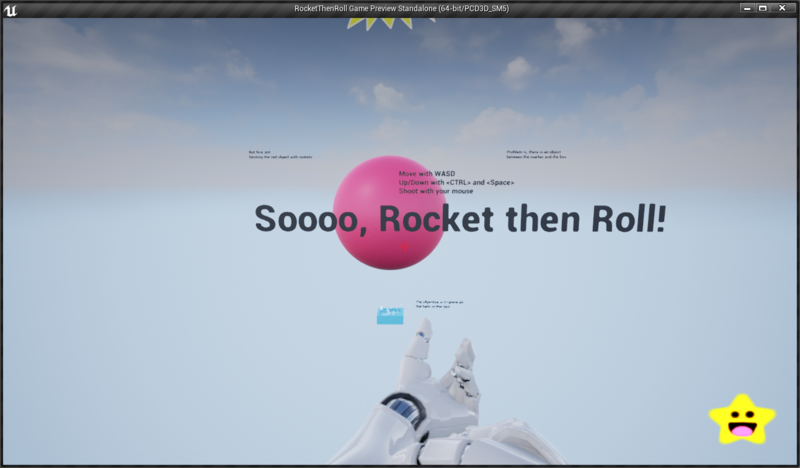 You literary have to shoot rockets before rolling :3 Extremely fun project to create, learned so much about Unreal and even some "under the hood". The game is extremely resource hog. Beware, it may fry your GPU or use all your Virtual Memory. This is my first time coding on Windows. I hope i haven't compiled the code using weird/uncommon CPU instruction sets. Please, let me know if it doesn't work for you. Last edited by AranHase; 07-27-2015, 07:35 AM. "Alexander Paschall has exceeded their stored private messages quota and cannot accept further messages until they clear some space." Let me know when I can send you a message so I can send you our emails! Drive your rocket as fast as you can in a proceduraly generated rocky maze, going slow will reduce the volume of the rocky music, and low music means DEATH. The maze will continue until the song ends. Last edited by woeavatar; 07-27-2015, 01:31 AM. I am blown away this time. There's not been a single bad entry! Well done everyone! I feel sorry for the judges; They've got a massive undertaking ahead of them - Well done everyone! "Information shouldn't be behind a paywall, It should be free for all!" Can anyone take a glance at my crash log? I've been mucking with it for nearly 3 hours, and unfortunately, I have to admit defeat this game jam.